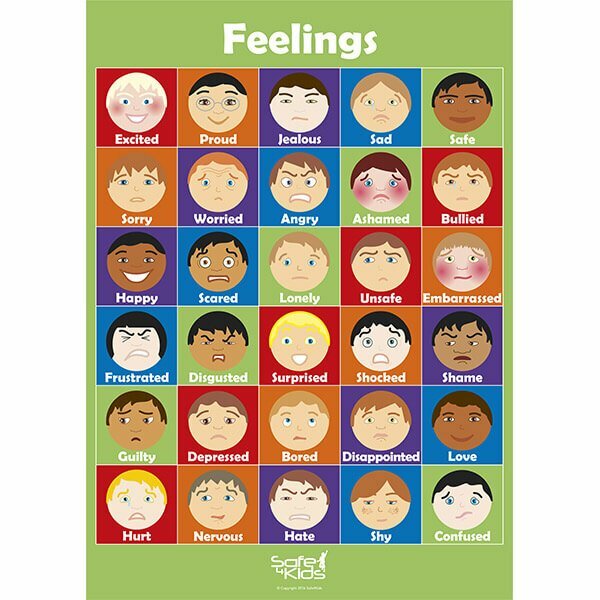 Our Feelings Poster is a great resource to help increase and reinforce children’s feelings vocabulary. Most children only use four feelings words – happy, sad, angry and scared. This colourful poster depicts 30 feelings! Angry, Ashamed, Bored, Bullied, Confused, Depressed, Disappointed, Disgusted, Embarrassed, Excited, Frustrated, Guilty, Happy, Hate, Hurt, Jealous, Lonely, Love, Nervous, Proud, Sad, Safe, Scared, Shame, Shocked, Shy, Sorry, Surprised, Unsafe and Worried. Expanding children’s feelings vocabulary can aid in child abuse prevention education, as it may help them express their feelings and emotions to trusted adults if they feel unsafe. Other items in our feelings and emotions range include our Feelings Bingo game and Feelings Cards game. The poster is 59 cm high and 42 cm wide. We send all of our posters flat packed between two cardboard pads to ensure they arrive in great shape.